IT was an obvious question to pitch to Australian Jarmila Gajdosova in the afterglow of such a significant career breakthrough. And the response to whether she believed this day would ever dawn illustrated self-belief and gritty resolve. “If I didn’t, I wouldn’t be playing, would I?,’’ Gajdosova said after an overdue first Australian Open win at her 10th attempt. 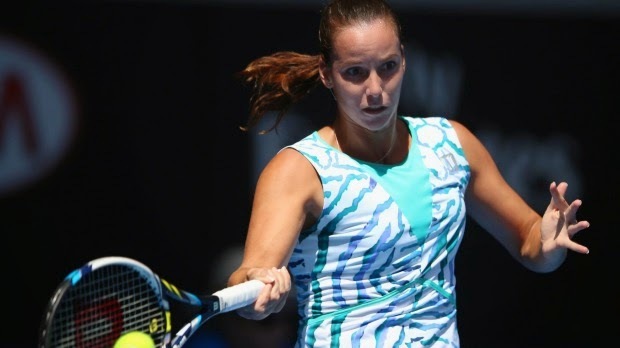 The Slovak-born Aussie sent the Margaret Court Arena crowd into rapturous applause when she sealed a 6-3 6-4 first round triumph over Romania’s Alexandra Dulgheru. “I felt really relieved and happy. I did feel like I won the Australian Open because I did try so hard for all these years to make it through,’’ Gajdosova said. “It meant so much to finally do it in front of my home crowd. They been cheering for so long and so well it was really important. It meant the world to me. It’s the first time the 27-year-old, who fell in love with Australia on her first visit 13 years ago, had earned a favourite draw after years of being pitted against high seeds like Serena Williams. “I guess, for the first time, I actually had a draw that I didn’t have a seed in the first round. As much as every match is hard to win, at least I had a big opportunity to get through,’’ she said. “It was my 10-year anniversary, so there was going to be celebration or one for the sadness. I’m glad it’s a celebration. Gajdosova is back near the form of a career-high 25th ranking in May 2011 after a series of debilitating injuries and illness. “When I played Serena, I was coming off two months with shin splints. Always something was happening and it was never the best preparation,’’ she said. Given Gajdosova’s solid lead-up form, the breakthrough wasn’t really a surprise — she beat 13th ranked German Andrea Petkovic and last year’s Australian Open runner-up Dominika Cibulkova, the world No.11, on the way to the quarter-finals in Sydney where eventual champion Petra Kvitova needed three sets to finally stop her. Her reward this time is a second round showdown with a more daunting Romanian foe, world No.3 Simona Halep who made short work of Italian Karin Knapp 6-3 6-2. “It seems like I’ve been playing all the top tenners in the last three weeks, so I’m going to go to play the way I played today, the way I played last week. I will fight and do my best,’’ she said.